But there is hope for the show to continue on — a source indicates Hulu is in talks to revive the show for a multi-season pickup, though it’s too soon to know if it’ll actually work out. Would you like to see MINDY move to Hulu? Hulu has nabbed the streaming rights for SEINFELD, and a multi-year deal with AMC Networks Inc. for “the exclusive SVOD rights to new and upcoming primetime scripted comedy and drama series from AMC, IFC, BBC America, Sundance TV and WE tv.” — which includes the upcoming WALKING DEAD spinoff, FEAR THE WALKING DEAD — the site announced. SEINFELD will join Hulu’s platform in June. The AMC Network titles will be made available after each season concludes. Hulu has bulked up its original series lineup: the streaming service has ordered THE WAY — a drama from creator Jessica Goldberg and produced PARENTHOOD/FRIDAY NIGHT LIGHTS/ABOUT A BOY’s Jason Katims — straight-to-series. Do you think you’ll be watching THE WAY? Hulu’s adaptation of the Stephen King book, “11/22/63,” has nabbed James Franco as its lead, Hulu and Warner Bros. announced. Are you excited to see what Franco does with the role? We’re just one week away from the Hulu debut of THE WRONG MANS’ complete second season, and to celebrate that, Give Me My Remote has an exclusive piece of artwork representing the third episode of the upcoming four-episode season. In case you missed the first season of THE WRONG MANS (which is currently available on Hulu, so you should go check it out), Sam (Mathew Baynton) ended up on an adventure after he found a cell phone in the wreckage of a car crash and answered a ransom call. The fallout from that led to Sam and his co-worker, Phil (James Corden) going on a crazy adventure where they attempted to save the woman who was being held hostage, and ended up in the middle of a crazy conspiracy. Hulu is adding to its original content slate: the streaming service has ordered CASUAL, a half-hour comedy from executive producer Jason Reitman, straight to series. Hulu has ordered 11/22/63 — based on the Stephen King novel with the same name — straight to series. ““On November 22, 1963, three shots rang out in Dallas, President Kennedy was killed, and the world changed. What if you could change it back?” Hulu is about to take viewers on a journey to find out in 11/22/63, a new Hulu Original series from J.J. Abrams’ Bad Robot Productions (Person of Interest, Fringe, Lost), acclaimed author Stephen King, executive producer/writer Bridget Carpenter (The Red Road, Parenthood, Friday Night Lights) and Warner Bros. Television. The announcement was made today by Craig Erwich, Senior Vice President and Head of Content, Hulu. Based upon the best-selling 2011 novel written by King and published by Scribner, 11/22/63 is a thriller in which high school English teacher Jake Epping travels back in time to prevent the assassination of President John F. Kennedy. But his mission is threatened by Lee Harvey Oswald, his falling in love and the past itself … which doesn’t want to be changed. A nine-hour event series, 11/22/63 has received a direct-to-series order from Hulu, and the project marks the first original programming collaboration between Hulu and WBTV. J.J. Abrams, Stephen King, Bridget Carpenter and Bryan Burk are executive producers of 11/22/63. Carpenter will write the teleplay, based on the novel by King. Bad Robot’s Kathy Lingg is co-executive producer, and Athena Wickham is producer. Hulu will be the U.S. home for 11/22/63, and Warner Bros. Worldwide Television Distribution will distribute 11/22/63 globally. Stephen King is one of the world’s most successful writers, having published more than 50 books in an illustrious career spanning 40 years, from the publication of his first novel, Carrie, in 1974, through to the upcoming November 11, 2014, release of his latest, Revival. 11/22/63 was named one of the 10 best books of 2011 by The New York Times, named one of 10 books we loved reading in 2011 by USA Today and honored as an example of notable fiction of 2011 by The Washington Post. King’s works have been adapted for theatrical motion pictures and television more than 50 times, including projects such as Carrie, The Green Mile, Maximum Overdrive (which he directed himself), Misery, The Mist, Pet Sematary, The Shawshank Redemption, The Shining and Stand By Me, to name just a few. King is also currently an executive producer of the CBS series Under the Dome. J.J. Abrams is currently at work writing, producing and directing the highly anticipated feature film Star Wars: Episode VII, and he is also producing the next installments of the Mission: Impossible and Star Trek movie franchises. Abrams’ Bad Robot Productions is best known in television for its hit series Felicity, Alias, Lost, Fringe and Person of Interest, among others. Are you excited to see 11/22/63? Watch the Pilot for ABC’s FOREVER Now! ABC has had a rough time launching new Tuesday dramas at 10 PM, but the network is attempting to combat that by releasing the pilot for the upcoming series, FOREVER, early online. FOREVER follows medical examiner Henry Morgan (Ioan Gruffudd)…who just happens to be immortal. 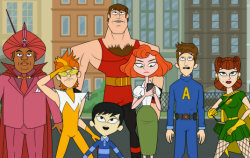 Hulu has renewed its original animated series, THE AWESOMES, for a third season. THE AWESOMES follows the superhero team The Awesomes, as they attempt to rebuild their dynamic/reputation after the most powerful members of the team leave. Seth Meyers, Ike Barinholtz, Bill Hader, Taran Killam, Rashida Jones, Paula Pell, Josh Meyers, Kenan Thompson, Bobby Lee, Steve Higgins, Emily Spivey and Bobby Moynihan provide the voices for the characters. If you haven’t watched THE AWESOMES, you should fix that ASAP. The entire series is on Hulu, and it’s so worth your time. Are you excited for more of THE AWESOMES? Hulu’s original series, QUICK DRAW, is returning for its second season on Thursday, August 7th, and things are as crazy as ever for the Western improv series: there is a wedding, proposals, disgusting dead bodies, and, of course, more Harvard mentions than you can handle. Hulu’s newest original series, THE HOTWIVES OF ORLANDO, may be a parody of the HOUSEWIVES franchise, but you don’t have to be familiar with the reality shows to appreciate the comedy of what’s going on. Heck, some of the actresses involved with the Hulu comedy hadn’t seen the show before they agreed to be a part of HOTWIVES. Hulu has acquired exclusive rights to SOUTH PARK, the streaming site announced during their Television Critics Association press tour session. Exclusive: Watch the QUICK DRAW Season 2 Trailer! QUICK DRAW — a Hulu original series/western comedy that follows Sheriff Hoyle (played by John Lehr, who also co-created the series) and his exploits in Kansas in the late 1800s — returns to Hulu on August 7th with new episodes, and as you can see in the exclusive season 2 trailer below, things are as crazy as ever: there are botched fights, real fights, bears, clowns, a baby pig, awkward declarations of love, and so much more.